Television news crews gather in front of the home of Robert and Arlene Holmes, parents of James Eagan Holmes, 24, who is accused of killing 12 and injuring 58 people in a Colorado movie theater shooting. As news crews swarmed outside the tile-roofed house of accused shooter James Eagan Holmes’ parents in an upscale suburb of San Diego, a stranger 1,300 miles away in Texas grieved for those inside. 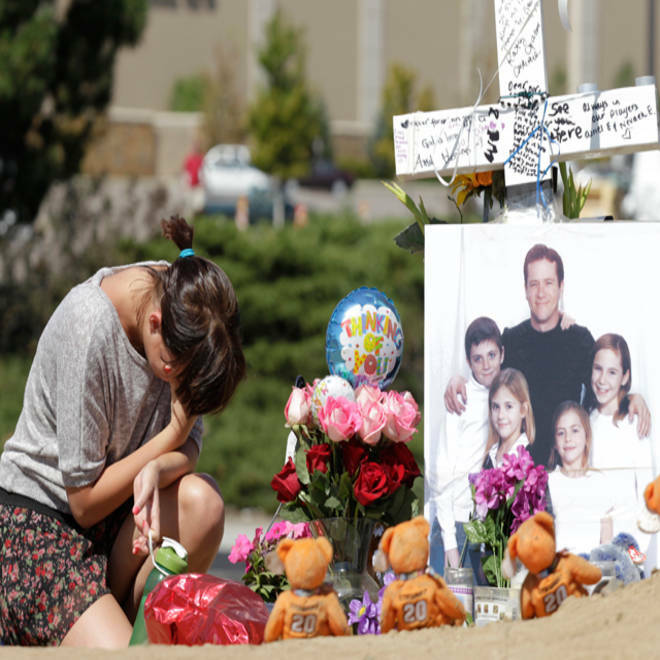 Last Friday, when Holmes allegedly opened fire in a movie theater in Aurora, Colo., his parents, Robert and Arlene Holmes, were instantly thrust into a club that no one wants to join: family members of notorious killers. Like the parents of Tucson shooter Jared Loughner, Oklahoma City bomber Timothy McVeigh and Columbine High School killers Dylan Klebold and Eric Harris, they’re quickly becoming pariahs, publicly reviled for raising a monster. But a group organized on behalf of murder victims’ families urges compassion and understanding for the families of murderers, too. They suffer in a different way than those who lose loved ones to violence, said Renny Cushing, founder and executive director of Murder Victims' Families for Human Rights, or MVFHR, which has organized support sessions for killers' families. That’s all too familiar to Robison, a retired third-grade teacher. Her son, Larry Keith Robison, was executed in 2000 in Texas for the grisly murders of five people, including an 11-year-old boy. He had been diagnosed with paranoid schizophrenia at age 21, three years before the 1982 murders. Though it’s been nearly 30 years since the crime, Robison still clearly recalls the shock and horror of the early days -- and the reaction of some in the community of Burleson, Texas. Reporters surrounded her home; in ensuing months, some parents asked to have their children removed from her class. No longer were they Ken and Lois Robison, the local schoolteachers. “We became the parents of a mass murderer,” said Robison. It’s a shift that happens quickly as a restless public searches for someone or something to blame for senseless acts of murder, said Cushing. Indeed, Arlene Holmes, 58, a registered nurse, and Robert Holmes, 61, a scientist, are being publicly reviled. Some Internet commenters have called them “abusive” and suggested that they are responsible for their son's alleged acts. Theater shooting suspect James Eagan Holmes appeared in court for the first time Monday where a judge explained why he was being held on no bond. NBC's Mike Taibbi reports. The Holmes family has expressed sorrow for the 12 people killed and 58 injured in the attacks, and, through their lawyer, asked for privacy as they grapple with the situation. They indicated they would stand by their son through the ordeal. “I think anyone can imagine how they’re feeling, anyone who’s ever been a parent,” said lawyer and family spokeswoman Lisa Damiani at a press conference Monday. Slideshow: Shooting at Batman screening in Aurora, Colo.
As many as 12 people were killed and 50 injured at a shooting at the Century 16 movie theatre in Aurora, Colo. early Friday during the showing of the latest Batman movie. Families of murderers are grief-stricken after such a tragedy, but, unlike the families of the victims, they may feel they have no right to their feelings, said Bud Welch, whose 23-year-old daughter, Julie, was killed in the Oklahoma City bombings in 1995. Welch met with Bill McVeigh, the father of Timothy McVeigh, who was executed for the crime. Instead, the family members of the killers struggle for the rest of their lives with shame and guilt over their loved one’s acts. “I said, 'Bill, you have nothing to apologize for. You did not do it. You did not contribute to it,' " Welch recalled. That message has provided some solace to other families of murderers. Welch met with the parents of Eric Harris, one of the two killers who led, and died in, the 1999 Columbine High School shootings. Public sentiment vilified Wayne and Kathy Harris, Eric’s parents, and also Tom and Sue Klebold, the parents of Dylan Klebold, the other Columbine shooter. Lois Robison said she and her husband, Ken, now 81, have found comfort and empowerment in speaking out about their son's crime, and about the need for adequate care for mental illness. They had great support from family members and those in the community who knew them, she added. "When this happened, my husband said 'We can do one of two things,'" Lois Robison recalls. "We can crawl into a cave and pull a rock in there behind us. Or we can tell the truth and try to keep it from happening to someone else.'" Bud Welch said he’s tempted now to reach out to victims of Aurora, both the families of those who were killed -- and the family of the alleged killer. In the Colorado city where one of the worst mass shootings in American history took place, the massacre prompted many to seek firearms for self-defense. NBC's Mike Taibbi reports.